Argus is a two channel, tunable diode laser instrument set up for the simultaneous, in situ measurement of CO (carbon monoxide), N2O (nitrous oxide) and CH4 (methane) in the troposphere and lower stratosphere. The instrument measures 40 x 30 x 30 cm and weighs 21 kg. An auxiliary, in-flight calibration system has dimensions 42 x 26 x 34 cm and weighs 17 kg. The instrument is an absorption spectrometer operating in rapid scan, secondharmonic mode using frequency-modulated tunable lead-salt diode lasers emitting in the mid-infrared. Spectra are co-added for two seconds and are stored on a solid state disk for later analysis. The diode laser infrared beam is shaped by two anti-refection coated lenses into an f/40 beam focused at the entrance aperture of a multi-pass Herriott cell. The Herriott cell is common to both optical channels and is a modified astigmatic cell (New Focus Inc., Santa Clara, California). The aspherical mirrors are coated with protected silver for optimal infrared reflectivity. The cell is set up for a 182-pass state for a total path of 36m. The pass number can be confirmed by visual spot pattern verification on the mirrors observed through the glass cell body when the cell is illuminated with a visible laser beam. However, instrument calibration is always carried out using calibrated gas standards with the Argus instrument operating at its infrared design wavelengths, 3.3 and 4.7 micrometers respectively for CH4 and CO detection. The electronic processing of the second harmonic spectra is done by standard phase sensitive amplifier techniques with demodulation occurring at twice the laser modulation frequency of 40 kHz. To optimize the secondharmonic signal amplitude in a changing ambient pressure environment the laser modulation amplitude is updated every 2 seconds to its optimal theoretical value based upon the measured pressure in the Herriott cell. Loewenstein, M., et al. 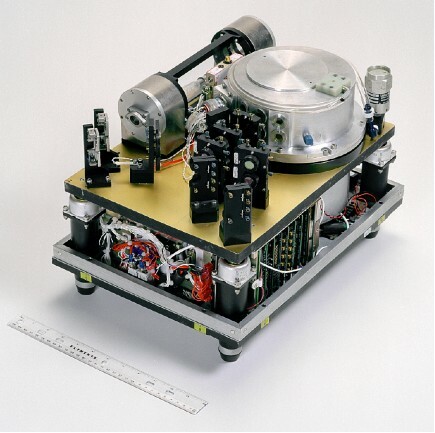 (2002), Argus: a new instrument for the measurement of the stratospheric dynamical tracers, N2O and CH4, Spectrochimica Acta Part A: Molecular and Biomolecular Spectroscopy, 58, 2329-2345.